You can take your iPhone just about anywhere with you these days. On the bus, in the car, for a walk, or when you’re out for a bike ride. And, because your iPhone has all of your favorite music on it, you definitely want to make sure you have it whenever you’re heading out to the gym. But now there’s another reason to take your iPhone out to the gym with you – and that’s the Six Pack Abs app for the iPhone! 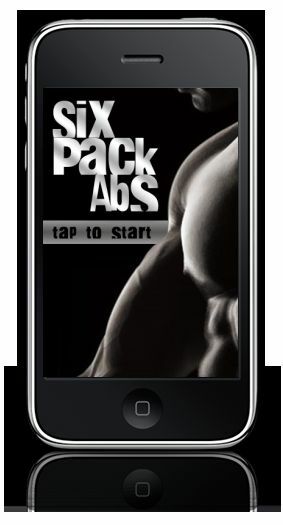 The Six Pack Abs app for iphone , ipad or ipod touch will let give you all the nutritional and exercise information you need with content surrounding topics including home gym info, a nutritional and cardio section, and a 1-Rep maximum calculator. But the app is fully interactive too and will let you record your own workout information, so you will know where you stand in your fitness goals. Record what exercises you did, how many reps you did, and what stretches you completed. Write it all down so that when you need to up the ante in your workout, you know exactly where you’ve been and where you’re headed. You’ll also get tons of ideas for exercises you can do with full pictures and illustrations, and you don’t even have to be connected to Wi-Fi to do it. The six pack abbs ipad app doesn’t rely on the Internet so you’ll have all the information wherever and whenever you need it. The only thing bad about this app is that it’s not free, but you won’t have any irritating ads to deal with while you’re trying to get serious about fitness either. And, for only $0.99, it’s easy to see why millions of people have already downloaded the Six Pack Abs app for the iPhone.